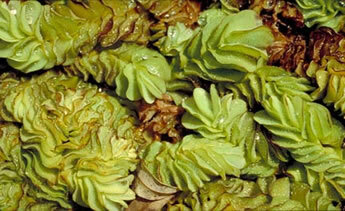 Facts about Salvinia plant. Salvina is a plant whose origin can be traced to South America. It has a reputation of causing aquatic devastations to native areas all through the United States. The Salvinia free-floating plant is usually grouped together with weeds that are considered noxious. It can be readily seen either in slow moving or quiet and still fresh waters. Salvinia free-floating plant is generally a free flowing plant that develops into dense clusters, colonies or floating mats in quiet waters. The floating leaves measure about 1/2 to 1 1/2 inches (1.2 to 3.8 cm) in length and are oblong-shaped. The Salvinia free-floating plant leaves also have a conspicuous midrib which also serves as the centre of folding. The upper surface of the leaves have stiff hairs. From time to time, these leaves fold forming a compressed and chain-like structure. In the giant Salvinia plant species, the leaf hairs comprise a single stalk which goes on to divide into 4 branches that end up reconnecting at tip. This makes the hair to form an egg –beater or cage-like appearance. Underwater, the leaves appear slightly different. Here, they are modified into tiny root-like structures. The whole Salvina plant measures approximately 1 - 2 inches (2.5 to 5 cm) in depth. Salvina plants are ferns and as such do not bear flowers. Despite the presence of sporangia on Giant Salvina plants, they still reproduce by fragmentation. With good conditions, the giant Salvina can double its size within a span of 4 to 10 days. Since it grows pretty fast, it has the capacity to spread over and cover a large area of water within such a short duration. This makes its elimination some sort of a challenge. The Salvinia plant has such a strong tolerance to environment stress and harsh conditions making it very aggressive and competitive compared to other aquatic species. The Salvinia plant has an impact on various water related activities such as irrigation systems, fisheries, rice farming, water navigation and transport, and even electric power production.